Located in the heart of Dublin city on the historical Kildare Street, you will find one of the city’s most unique event venues, the Royal College of Physicians of Ireland, No. 6 Kildare Street. 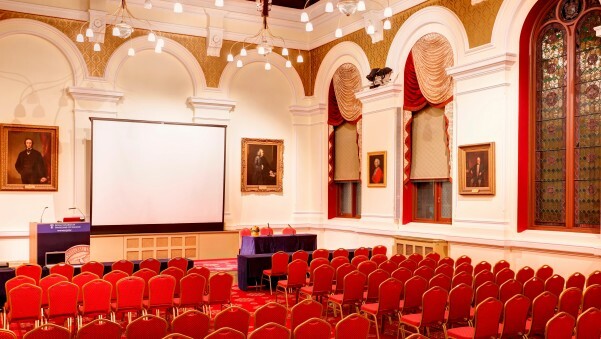 In this historical building dating from 1864, you will find 8 unique event spaces which will cater for between 2 – 190 people for multi-purpose events. When organizing the event, do a walk-through of the venue so you can visualize how the event will flow. This can be as simple as having a registration desk in the Graves Hall where the attendees of the conference can have tea, coffee and pastries prepared for them by Fitzers Catering before moving to the meeting in the Corrigan Hall. What do you plan to achieve from, how, what, why? When planning the meeting identify who you want to attend and what is your desired outcome for the meeting. Are you trying to sell a product or service or are you trying to communicate a message. How do you measure the success of the event? Send out invitations for the event as early as possible. Send a follow up invitation so to confirm numbers for the event. The worse thing that can happen is having rooms set up for too few people, where your attendees can be lost in the room or the having to many attendees which would create a scramble for chairs and space. When you have an accurate count of the expected number of attendees this will allow you to have more control over your costs when it comes to organizing catering. Royal College of Physicians of Ireland, as they can liaise with the supplier in organizing access times and where they can store any material if required. The event was an outstanding success, this allows you to follow up with your attendee post event so to get feedback in relation to their opinion of the event. It also gives the opportunity to pitch a product or service to an event attendee.